Banks are under unprecedented pressure to ensure and demonstrate compliance with regulatory requirements across various geographies in which they operate. With the complexity of multiple sets of regulations and regulators, combined with the stringent consequences of compliance failure, building a compliance program on the foundation of manual processes and ad-hoc procedures is not recommended from a risk as well as cost perspective. 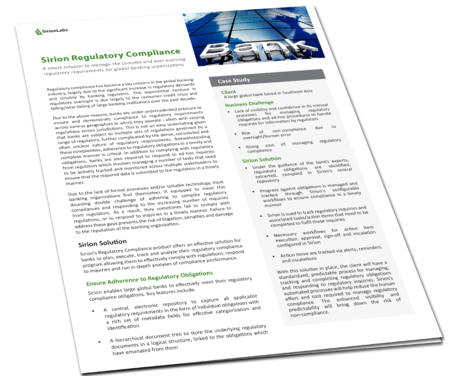 Technology can help banks get a clear view of applicable regulatory obligations, ensure process standardization in completing tasks and action items, and track progress in real-time.